India vs Australia 3rd Test Melbourne: The pitch is flat and the run-getting is slow, which does not make for an ideal Boxing Day Test. India vs Australia 3rd Test Melbourne: The pitch is flat and the run-getting is slow, which does not make for an ideal Boxing Day Test. 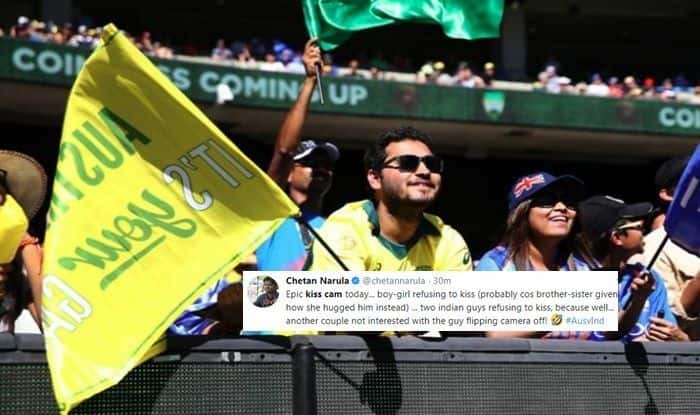 But, fans at the MCG had enough reason to cheer when the ‘kiss cam’ spotted them. The first day of the Test had a huge turnout as 73,516 spectators turned up, but it seems the ‘kiss cam’ stole the show hands down. So, what is a ‘kiss cam’? ‘Kiss Cam’ is a regular thing in some of the biggest sporting events across the world. It captures some lovely moments where the couple is indulged in kissing each other and then displays it on the giant screen at the stands. Here is the video of the ‘kiss cam’ doing its bit during a break when India was on 174/2. Here is how the initiative got Twitter excited. Meanwhile, India has declared their first innings at 443/7. Cheteshwar Pujara was the star for India as he slammed his 17th Test ton and his second century of the ongoing series. Indian pacers will now have an opportunity to bowl at the hosts for 7-8 overs and the visitors will look to get a couple of wickets tonight.